This blog has been quiet for a few months, partly because we’ve been busy with other projects, and partly because there has been very little to report from the far-right in our region. However, this happy absence of muppets has ended with a day-trip by Britain First to Nottingham last Saturday. 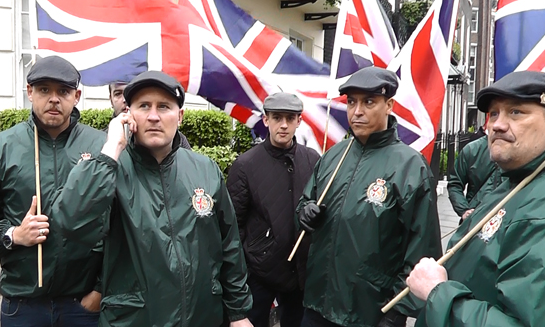 We hear that about 15-20 of the BNP offshoot were in the city leafletting as part of their”national action”. Easy to spot in their green knock-off leisurewear, their main focus seemed to be attempting to intimidate an islamic info street stall. The wannabe “street defence organisation” were apparently taken aback at the refusal of the young muslims to wilt before their verbal onslaught, and a number of passersby also showed their disdain for Britain First and their clumsy attempt at provocation. After a bit of standing around and scowling, the fascists dispersed. Having been countered by effective opposition when they declared a “national tour” earlier in the year, and more recently in Rochester, Britain First have obviously decided that turning up unannounced gives them a chance to mobilise with no organised opposition. It’s a shame that they were able to leaflet unchallenged for a while in Nottingham, but good to hear that they were not well received on the streets. Despite their clownish incompetence, Britain First are attempting to establish themselves as a provocative fascist street presence, and anti-fascists need to keep an eye out for them and counter them wherever they may crawl into the light.